A dairy farmer got the shock of a lifetime this week after stumbling upon a sinkhole the length of two football fields and the depth of a six-story building on a farm in Rotorua, a town located on New Zealand's North Island. According to local media reports, a farmer discovered the sinkhole before dawn when he was rounding up his cows for milking. 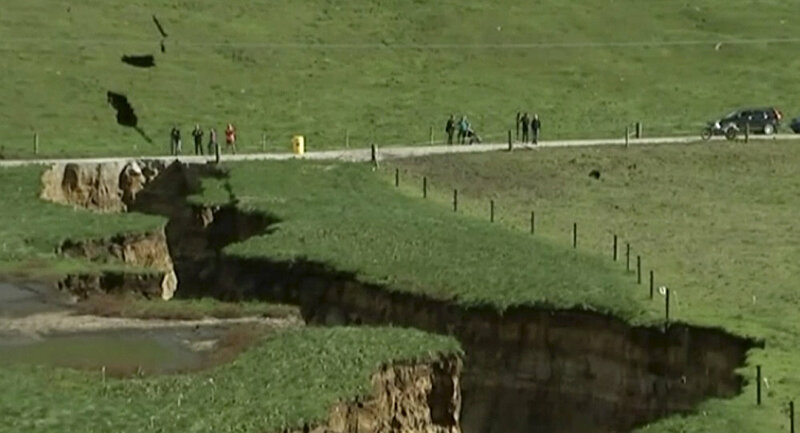 Colin Tremain, the farm manager, told local outlet Newshub that he hadn't realized just how large the sinkhole was until he saw it in daylight. ​After examining the discovery in person, vulcanologist Brad Scott told ABC News that it likely took several decades for the underground cavity to form. "The largest I've seen prior to this would be about a third of the size of this, so this is really big," Scott said. "The cavity would have been present from all the rainfall events over the last 40, 50, 100 years. The high-intensity rainfall that we experienced on the weekend just accelerates the process." Speaking to TV New Zealand, the official said that he could see "the original 60,000-year-old volcanic deposit that came out of this crater." Wanting to prevent animals from falling inside the sinkhole, Tremain told Newshub that he intends to install a fence. "We'll keep it fenced off as it is to keep stock out," but he stressed that "stock aren't stupid, they're not going to walk into a hole, they can spot danger."